This is a known issue which only affects certain graphics cards. There is nothing wrong with WADmerger and the programme will work fine. If you have this problem, you will have to use Strpix to view your objects in colour. The rollingball uses the BOULDER_FALL (bouldlnd.wav) sample. If you check the sound.txt you will see that this sound is only assigned to three levels and that it is not #g, which means general. And general means it is included in every level. Lara's sounds for example are all general sounds. It also uses ROLLING_BALL (l_rumble.wav). It's not general either. So if you change the sound.txt and add the letter of your wad to the BOULDER_FALL and ROLLING_BALL lines and convert it, it should work. If you only add the ROLLING_BALL sound you won't be able to hear the rollingball bouncing off the ground or landing on it. It will sound like those good old snowballs in TR2. Only a constant rumble until it settles down. You could also assign the sounds using Wadmerger's sound manager. Until now, whenever I've had a corrupted WAD, I've always rebuilt the WAD from scratch. Seems there is now a simpler method you can try first! This was discovered by Bedazzled. A bear in Pat's game had become corrupted and kept floating down from the sky when triggered. Nothing seemed to solve the problem. 2. save the wad and close wad merger. 3. run wadmerger and add the item again. You will normally find your problem has been solved. I only discovered it after spending several hours trying to make wadmerger and also fexanim to set the collision on an object I'd made. If you try to move your map and your rooms disconnect and then your level crashes, it's very likely you've pressed the pink L button while you had a room selected. I don't know what this button is for but it locks a room in place and you can't move your map without ripping it apart. This error message appears when the editor can't find your texture file. The editor automatically remembers the path to several needed files, including the texture set. If you rename or move the textures, the editor will not be able to find the file and will chuck this error message out at you. 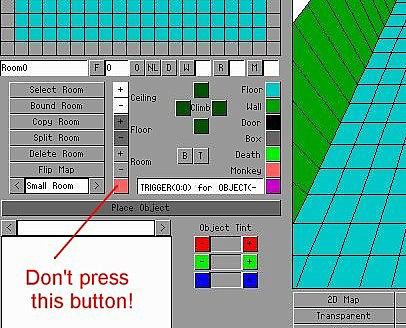 All you have to do is reload your texture set manually, save the project and then the editor will remember the path the next time you open your project. First, put your texture set into your map folder. Then open the editor and click the Load TGA button. Then browse to the map folder and open the texture set. Save your level, close it and reopen it again. Your textures and objects should now be nicely displayed. Made a discovery regarding non animating water triangle textures. When you have angles between rooms that require no collision and animating water triangle textures, sometimes one of the triangles doesn't animate. There are four possible triangles, starting from the corner of the square you have top left, then top right, then bottom left then bottom right. It is the top right texture triangle that doesn't animate. If you have this problem simply use another triangle and adjust it until it looks okay. This non animating triangle could be affected by other factors too, so if you find one of the other triangles doesn't animate, simply use another and it should be fine.